A new dive site off of our coastline here in Palm Beach has recently made a debut to Force-E Scuba divers. Palm Beach’s newest artificial reef site, the Ana Cecilia is the perfect wreck for scuba divers of all experience levels. The Ana Cecilia was put to rest on July 13, 2016 about a mile off of Singer Island, Florida. Her main deck is in 62 feet of water with the bottom at 85­­­­ feet making it easy to dive a phenomenal wreck with some great bottom time. The ship is part of a wreck trek called The Corridor, including the Mizpah, China Barge, Amaryllis and the Brazilian Docks. The Ana Cecilia is a 170 feet long freighter weighing 629 tons. She was previously used as a cargo ship carrying humanitarian goods to Havana from Miami. The ship carried clothing, hygiene products, food and other necessities. She was the first to make a direct US to Cuba voyage since the Cuban Missile Crisis in 1962. Once the transport operation shut down in April 2013, the ship changed hands and took on a new job. The Ana Cecilia made headlines for the second time in September 2015 when she was seized by the US Government for smuggling 413 kilograms of cocaine from Haiti, reported by the Palm Beach Post. Today, the Ana Cecilia is gaining growth of marine life and residential fish populations while contributing to conservation efforts of the surrounding reefs. During August through October, she houses many Goliath Groupers who aggregate in the area during their spawning season. On a regular basis, you can find large Barracuda, and schools of Blue Runner. As the weeks go by following her sinking, the ship is becoming home to sponge and soft coral growth and more dense fish populations. Prior to sinking, the ship was altered with scuba divers in mind. There are now large cutouts in the decks and companionways making easy swim throughs for adventurous divers. If underwater photography is your niche, you are going to want to add this site to your gallery, as the cutouts allow beautiful ambient light to penetrate many areas of the wreck’s interior. 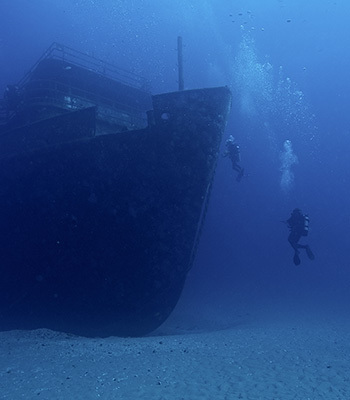 To explore the ins and outs of this wreck, you can give us a call to dive into a wreck specialty class with an experienced Force-E Instructor. You can find 5 plaques mounted on the ship stating the remembrance of local mariners who lost their lives. Three plaques belong to Deputy Fernandez Jones, his step-father 70 year old Willis Bell, and Jones’ 9 year old son Jayden who drowned after their boat capsized off of Martin County. The remaining two plaques are named for Austin and Perry, two 14- year old boys who went missing in July 2015 after leaving Jupiter Inlet. The boys were missing for months with tremendous search efforts up and down the eastern seaboard. There was no break in search efforts done by officials and locals before their boat was found off of Bermuda 8 months later. The Ana Cecilia is dedicated to honor the families and friends of these victims fallen to the sea. The best part about diving the Ana Cecilia is the favorable conditions year-round. Scuba Diving in Palm Beach is known for its drift diving and large marine life migrations. During the summer months the ocean is typically flat-calm on the surface with beautiful visibility down below. Summertime brings an occasional upwelling followed by an array of marine life. The winter months bring warm, gin clear water and large animal migrations can be seen moving by The Corridor. The Ana Cecilia can be enjoyed any time of year. She is rapidly obtaining growth and life, just as the other wrecks in The Corridor have. There are resident sea turtles and always plentiful tropical fish populations. Sponge and soft coral growth is dynamic and colorful on our local wrecks. While diving the Ana, don’t forget to look up occasionally, as you could see a Sailfish or even a school of African Pompano cruising by. The ship is now 1 of 150 artificial reef sites in Palm Beach County. Force-E does regular trips to the Ana Cecilia with local charter boats running daily. The site is less than 20 minutes from the dock, so come ready to have maximum underwater time and a boat load of fun! You can also experience the Ana Cecilia by booking a personal dive guide or taking an Advanced Open Water Class with an experienced Force-E Instructor. Regardless of your diving goals, you don’t want to miss this memorable site; with 45 wrecks in Palm Beach County, Force-E has got your back! Call Force-E Scuba Centers in Riviera Beach to schedule your new favorite diving adventure on the Ana Cecilia!